Heat oven to 300°F. In very large bowl, mix oats, sunflower nuts, almonds, flour, brown sugar and salt. In small bowl, beat oil, honey and water with wire whisk until well blended. Add liquid ingredients to dry ingredients, stirring until dry ingredients are moistened. Spread on 2 ungreased large cookie sheets with sides. Place both cookie sheets in oven on 2 separate oven racks, one below the other. Bake 20 minutes, stirring after 10 minutes. Reverse position of cookie sheets in oven; bake 10 to 20 minutes longer, stirring every 10 minutes, until golden brown. Cool completely on cookie sheets, about 30 minutes. Stir mixture to break apart. Stir in dried fruit. Store in tightly covered container. 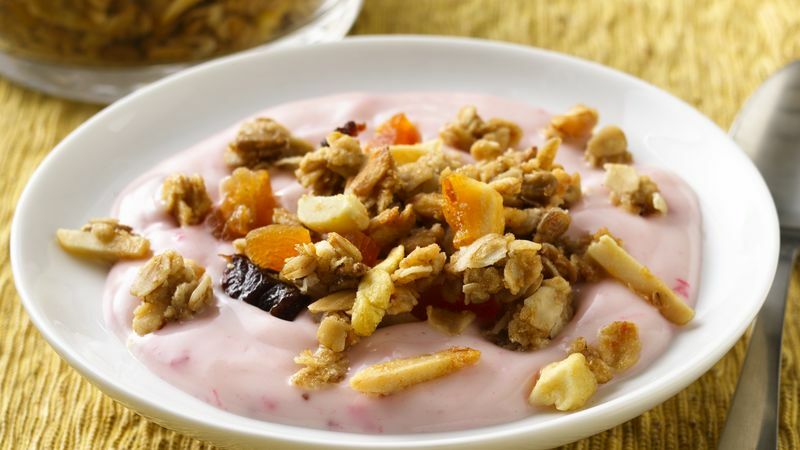 Sprinkle granola on top of yogurt, pudding or ice cream. Serve with milk for breakfast, or eat as a crunchy snack.